Every Tuesday grab 2 for 1 of our world famous burgers, char-grilled to perfection for the price of £13.95. 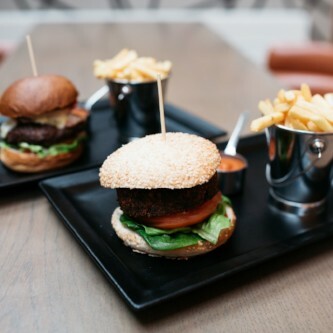 Vegan food is more than just a trend and this deal includes our Vegan Black Bean burger, which comprises black bean, pepper, garlic, agave syrup, white wine, cumin, chilli powder, coriander and Japanese red currants. Delicious! Offer available on Tuesday between 12-3pm and early evening dinner 5-6pm.